As a parent without a formal background in education, I felt overwhelmed when choosing a preschool for my kid. So many options, so many buzzwords, not to mention the waiting lists. Frankly, it made me a little panicky that education for a 3-year-old was so complicated. Did I have to choose between my child becoming a Mandarin-speaking math prodigy or actually having fun? If I made the wrong choice at this point, would I be dooming my child to a cascade of lost opportunities and academic failure in the future? 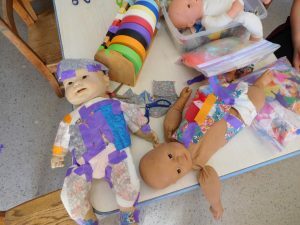 Melodrama aside, I had a valid concern that an overly academic program would turn her off school and thwart her natural desire to learn, but wondered if a play-based program would just be a glorified daycare with no real learning potential. Very young children learn quite differently than older children or adults. Quite simply, they are learning to learn. The good news is that they’re naturally good at it. They make sense of the world through all five senses, and they are constantly developing in multiple areas: cognitive, language, physical, social and emotional. When the environment around them is nurturing and interesting, children naturally build their understanding of the world around them, and this helps them gain confidence in their growing abilities. Most of us realize that preschoolers won’t benefit from flash cards or rote memorization, but do we understand how they learn best? 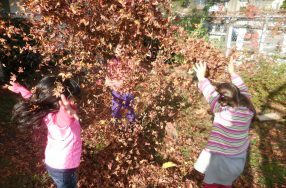 Free play—play without defined scripts or goals, fueled by imagination, often outdoors, often in groups, and often using loose parts or found materials– is the backbone of a play-based program. At APS, children choose and direct their activities. During opening circle, the day’s various options are presented by the teachers with an invitation to join in (here’s what’s happening in the yard today, in the games room, at the art table, at the snack table). It’s amazing how excited the kids are to head to their favorite activities. Mine generally rushes for a seat at the art table, devotes a substantial chunk of time to dress-up and games, enjoys a snack and spends the rest of the time outdoors digging in the sand, sliding/swinging/biking or playing with water. It’s not always in that order, but she generally makes a tour of the entire school every day. 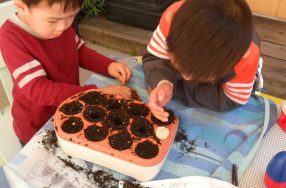 Other kids devote themselves deeply to a specific interest or project. Everything, from our process-not-product approach to art to the self-serve snack table, is designed to spark a child’s interest and grow their learning in a nurturing but non-directive manner. 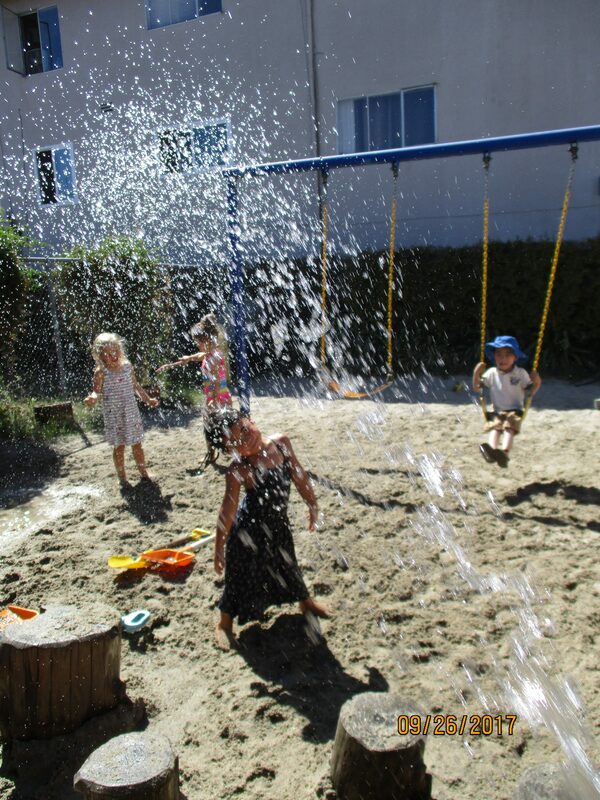 * Outdoor play, so critical to early development in myriad ways, is something APS excels at. Our children choose to spend a lot of time outdoors. There is no assigned recess time; they have open access to outdoor space at any time. That means APS kids can enjoy up to 2.5 hours outdoors per half-day, in any season and all elements. I think every parent who sends their child to preschool wants to know that their child is learning to express themselves, to play and communicate well with peers, and to self-regulate emotions and behaviors. Emotional competence, in addition to being a necessary life skill, is also linked to how well kids will transition to school and how well they perform academically in early grades. It depends on a child’s natural disposition as well as experience dealing with others. Preschool is an important time to build that experience, and a play-based environment gives children space to initiate their own ideas and learn social skills. APS is very group-oriented; almost all activities involve groups of kids coming together around common interests. When children create with their friends, they learn to present their ideas to each other and to negotiate strategies together. 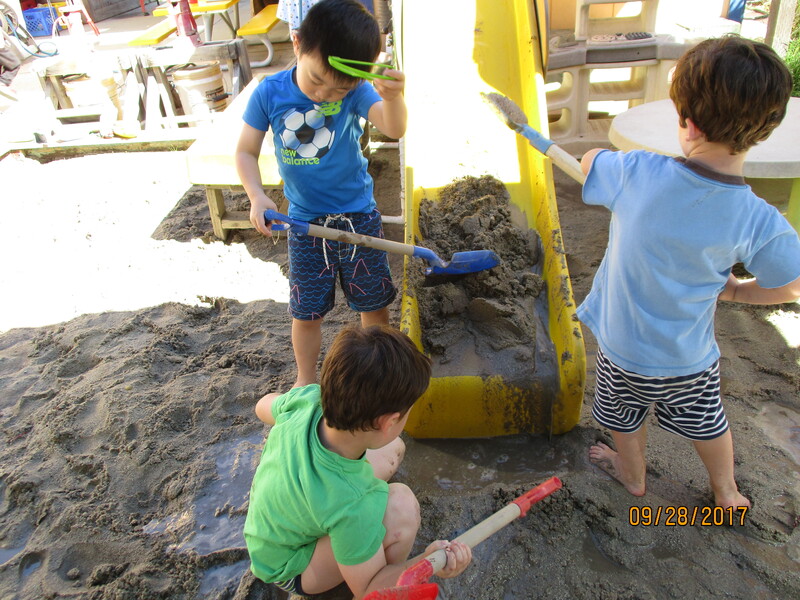 They gain skills in planning, problem-solving and cooperation. 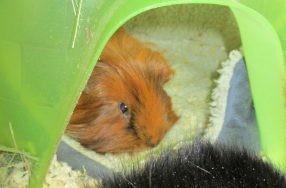 They learn to approach conflict with empathy and to become considerate of others. In cases of disaster (such as a Magna-tile tower crashing down) they learn to rebuild together or to invent new forms of play. They become resilient. Tell me the truth, does “play-based” just mean a chaotic free-for-all? APS is such a happy, peaceful, and fun place. Teachers provide a learning environment that is challenging and nurturing, supportive and non-judgmental. They do an amazing job of scaffolding (if, like me, you’re not an educator, that means that they set up opportunities for building learning). For a child, it’s comforting to know that the day begins with circle time, that the activities for the day will be explained, and that they can pick up on their favorite activity or start something new with friends. My daughter adores and trusts all of her APS teachers. 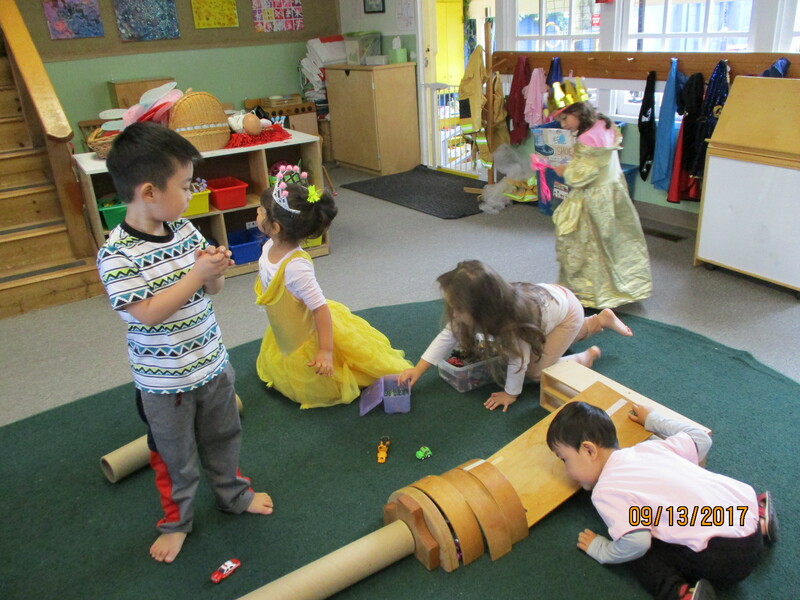 Sometimes they engage and invite her into play; often they observe in the background, letting kids really get into things with their peers without interruption and only providing guidance or intervention when needed. But will my child be ready for school when the time comes? Hopefully by now I’ve made the point that learning how to learn is more important in the preschool years than learning specific facts. 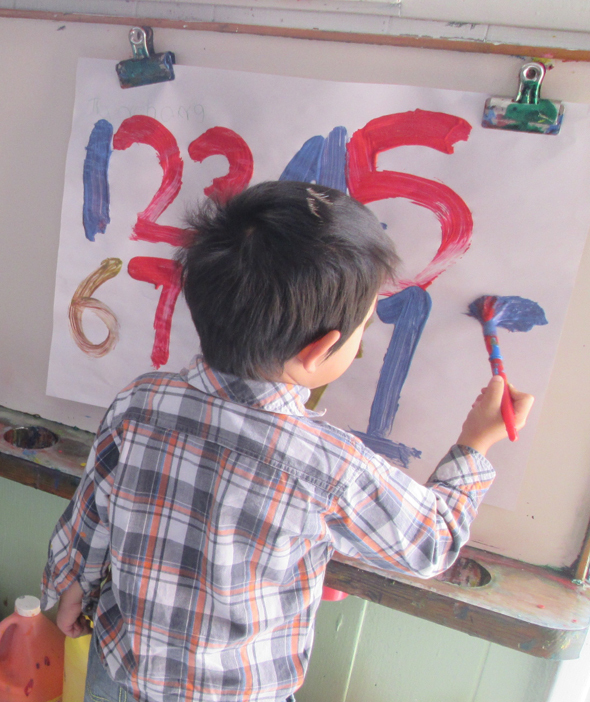 Learning letters, numbers, handwriting, etc. is included in the curriculum, but not the focus. 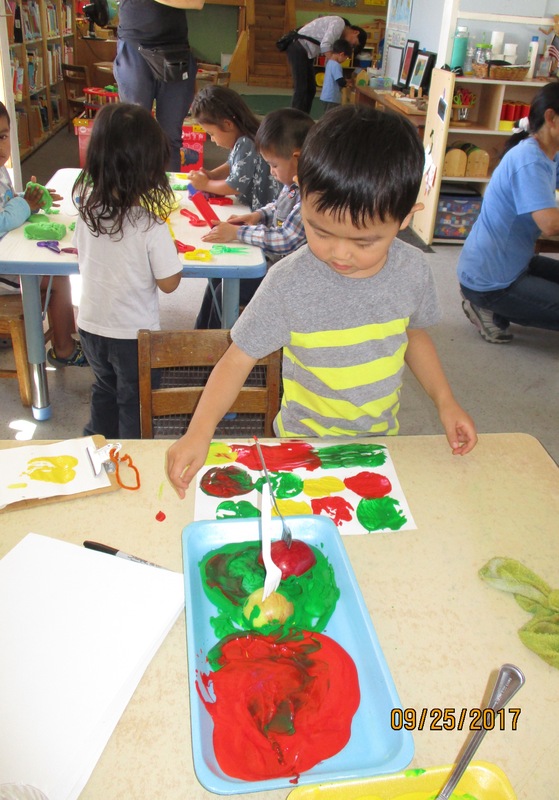 APS teachers do evaluate specific skills that children will need in kindergarten, and it turns out that APS graduates are very well prepared. The reason? Our children come out of APS with a strong disposition to learn, with confidence in creativity, exploration and adaptability, and with empathy and strong social skills. They love to learn, and that is something that every parent wants for their child. Snow, Kyle. 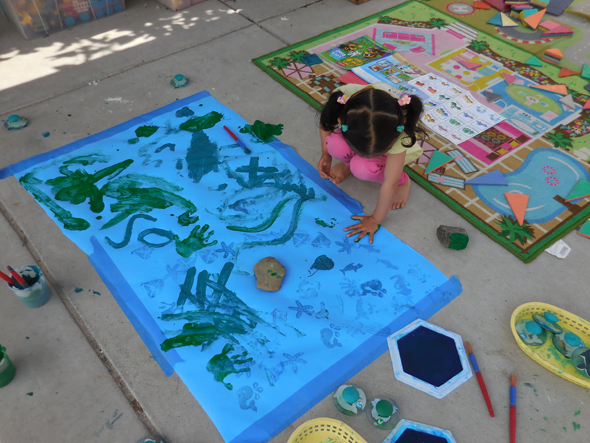 “Research news you can use: debunking the play vs. learning dichotomy.” National Association for the Education of Young Children, www.naeyc.org/content/research-news-you-can-use-play-vs-learning. Accessed 25 Sept. 2017. “Grade-by-grade learning: Preschool.” PBS Parents, www.pbs.org/parents/education/going-to-school/grade-by-grade/preschool. Accessed 25 Sept. 2017. Gopnik, Alison. “Why preschool shouldn’t be like school.” Slate, 16 Mar. 2011, www.slate.com/articles/double_x/doublex/2011/03/why_preschool_shouldnt_be_like_school. Accessed 25 Sept. 2017. Karim, Zohraida Sibtain. Let Me Be Me. Rosedog Books, 2017. Fitzgerald, Meghan. “Let ‘em spin! They’re learning.” Tinkergarten, 14 Jan. 2017, blog.tinkergarten.com/blog/2017/2/2/let-em-spin-theyre-learning. Accessed 25 Sept. 2017. Wisler, Joelle. “Unstructured Play Is The Parenting Miracle We’ve All Been Hoping For (Really).” Scarymommy, www.scarymommy.com/unstructured-play-is-parenting-miracle. Accessed 25 Sept. 2017. Golinkoff, Roberta Michnick, et al. Einstein Never Used Flashcards: How our children really learn–and why they need to play more and memorize less. Rodale Books, 2004. Doorley, Rachelle. 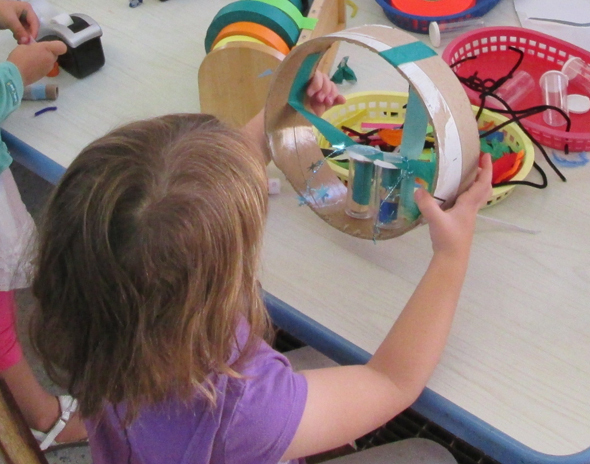 Tinkerlab: A hands-on guide for little inventors. Roost Books, 2014. Van’t Hul, Jean. The artful parent. Roost Books, 2013. National Association for the Education of Young Children. “Position statement: Developmentally Appropriate Practice in Early Childhood Programs Serving Children from Birth through Age 8.” Adopted 2009. www.naeyc.org/files/naeyc/file/positions/PSDAP.pdf. Accessed 25 Sept. 2017. One warm day this week, the children were enjoying splashing in the water outside and decided to make a water slide by directing the water down their slide. 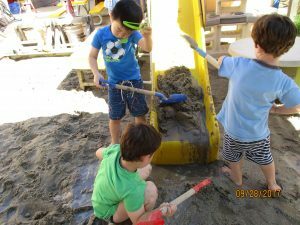 Then they decided to construct dams made out of sand to hold the water up, and enjoyed seeing how it changed the water flow. Teacher Nancy came by with some food coloring and dropped it in; now they could see how the color dispersed and moved with the changing current. It was all about them exploring interests and building on their knowledge to understand the world around them. Another example of fluid play: not long ago, a large amount of Styrofoam was donated to the school from somebody’s computer boxes. The children first decided to color it with markers. Then some boys decided to make a school out of it. A group of girls took over then and converted the structure into a rocket ship. Over the several days it was left out, the project evolved several more times, each new iteration bearing the unique ideas of a group of friends working together. Have you ever looked at a piece of art your child brought home from school and wondered what the point was? My kid and I used to attend craft time at the library. Generally, the teacher provided a sample of the project, and the children would try to copy it as closely as possible. Like many kids, mine would start to get frustrated that her project didn’t look like the teacher’s, and I’d swoop in to “correct” it. We’d come home with a cute but uninspired object that ended up in the recycling. Once I was busy chatting with another parent and realized that my kid had been working away contentedly and eagerly for a while. Instead of making a kitty cat like everybody else (with the regular number of eyes, ears and appendages), she was engrossed in covering the entire thing with googly eyes and star stickers. I reached toward her…..and stopped. She was doing something new and having a great time! It was her very own art, and it turned out super weird-looking and cool. 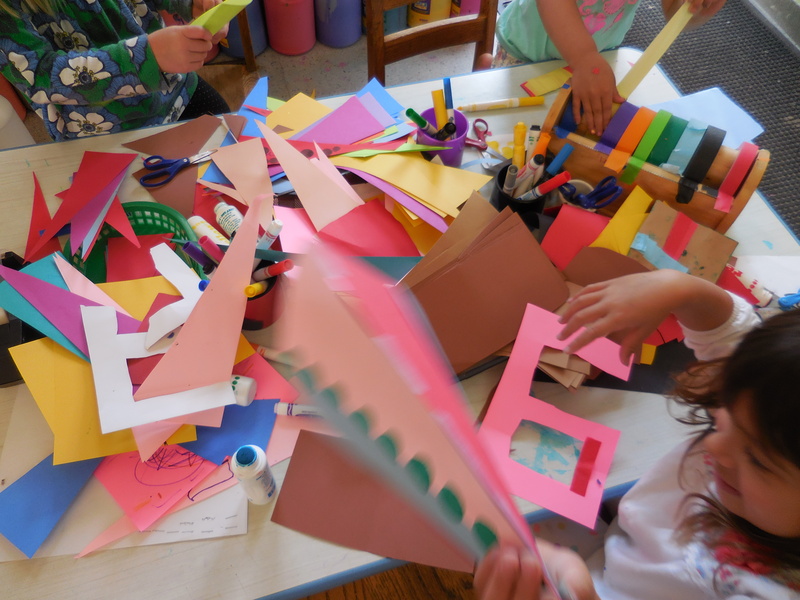 When my kid started at Albany Preschool, I noticed a different approach to art. The sheer volume of her projects went up, as well as the range of colors, loose pieces and materials (feathers?!) on them. More importantly, she was actually proud of her creations, asking us to put them up on the wall as soon as we came home. Helping out as a parent participator let me see just how APS approaches art. There is no 15-minute “art time” where children sit down, hurry through and produce a copy of the sample (the “art as a receipt for childcare” approach). 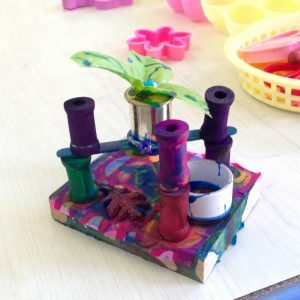 At APS, the art table is open; the artistic techniques and materials are introduced during circle time, and all are invited to come by the table. 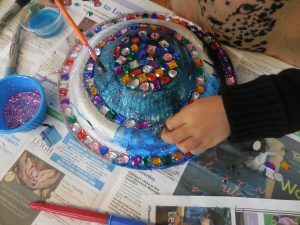 Children join in when they want to, and enjoy spending time making their creations. It’s fascinating to see what different works result. Some students are already developing their signature styles. Teacher Nancy and I were chatting one day, and she mentioned that there was a big difference between process-focused and product-focused art. I’d never heard of the distinction before, but that conversation was the start of a journey for me as a parent. Here’s what the difference is, and why it matters. Kids are natural innovators. I might sit mine down for “art time” and hope she makes something that we can frame for Grandma’s present. But she’s more interested in mixing the paint colors together and seeing what they look like on anything but the white paper I provided (her skin! the table! the dog!) She wants to see what else will stick in a blob of paint, or to explore the effect of adding lots of wadded-up masking tape. When it comes to art, I’m learning to provide the environment and an array of materials (a big workspace, music, and lots of colored paper, glue, paint, loose pieces), and then… I try to step back. I’m so grateful that my kid is encountering art at Albany Preschool, where our wonderful teachers are intentional about emphasizing process over product. That’s a big deal. Because it’s not about producing something pretty enough to hang on the wall, it’s about my child’s precious process of exploration, innovation and expression. 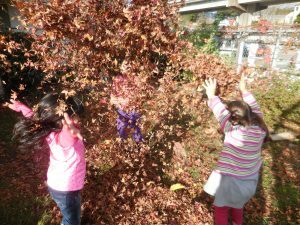 We have read books and sung songs with intention: About falling leaves turning colors and why they do, the weather changes in autumn, and the harvest season, along with all of the fun and other stories and activities that having a good time in preschool begs. 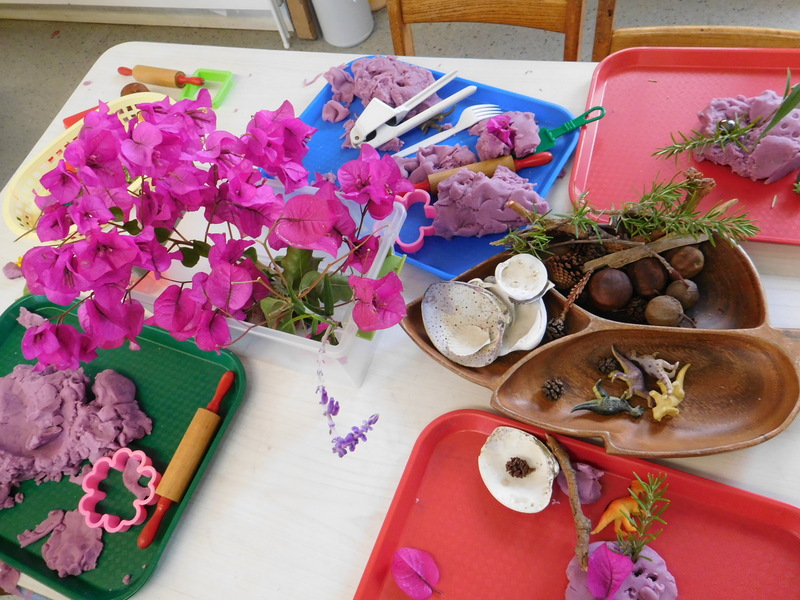 We have used branches, twigs and bark, pinecones (large, small and tiny), pine needles, seedpods, ferns, flowers, rose hips, and more in our play and in our process art. We have collected beautiful fallen leaves from our own north and south playgrounds, incorporated them in our play dough structures, washed them in our water table to better observe their beautiful changing colors, painted with them, tried leaf rubbings, and used them in a multimedia fall-color collage. We look forward not only to expanding our understanding of this beautiful season, but also to finding out what emerges from our playful daily constructions and inquiries, both individual and collective! 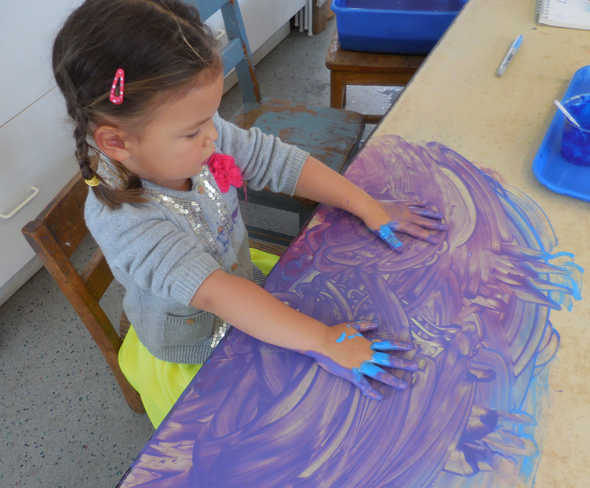 The art table is always open (and quite popular) at Albany Preschool. Every day an art project is announced at circle, and as soon as circle ends, our preschoolers rush to grab an empty seat. 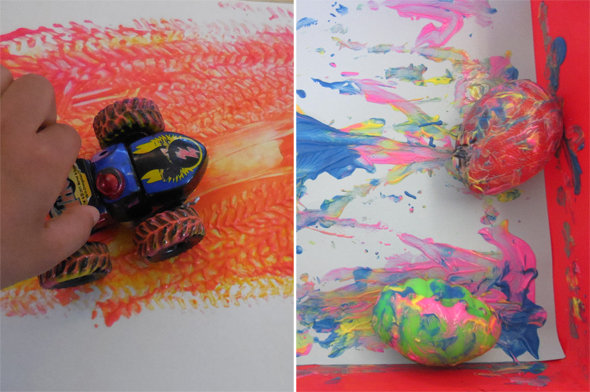 We make art with paint, tape, balls, fabric, cars, recyclables, yarn, sticks, rocks, our own hands, and so much more. You name it, we can make something with it. We know that kids love art, but why do we love art so much? 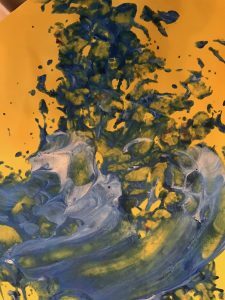 Art stimulates both sides of the brain, boosts self-esteem, strengthens hand-eye coordination, teaches open ended thinking, and helps children exercise their creative problem solving skills. Next time your child brings home their masterpiece, further the learning experience by talking to them about it. Say things like – How did you make that? Tell me about your picture. I see you mixed paints to make new secondary colors. I see different shapes, line patterns, brush strokes. And if you can, try avoiding value judgements such as – That’s beautiful, I like it, etc. You can have fun at home with art too. It can be as simple as dipping an old toothbrush in paint, stamping with rocks, cutting and gluing toilet paper tubes. Get creative – there is no wrong way to do it.